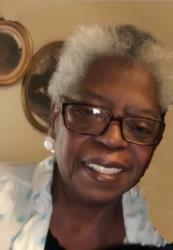 Mrs. Roge-Ge-Neal Smith, 73, of Elizabethtown, died on October 7, 2018 in Elizabethtown, KY.
Mrs. Smith was a native of Pelham, GA and the daughter of the late Alfred and Cleopatra Randall. She was a nurse and member of Berean Baptist Church. In addition to her parents, Mrs. Smith was preceded in death by by two brothers, Nathaniel Brown and Alfred Clyde Randall, Jr. Survivors include three daughters, Youlanga Purifoy (Larry), Michelle Sarvis and Donna Austin; one son, Leroy Antonio Smith, III; one sister, Diane Randall-Lewis; fourteen grandchildren, twenty-one great grandchildren; her sister/friend Michele Jones and three special and dear friends, Darlene Hiesle, Linder Freeman and Suk. Funeral service will be 2:00 pm on Saturday, October 13, 2018 at Berean Baptist Church in Elizabethtown, KY with Bro. Randy Logsdon officiating. Burial will follow in Hardin Memorial Park Cemetery in Elizabethtown. Visitation is from 12 noon till 2:00 pm Saturday, October 13, 2018 at Berean Baptist Church. Such a loving Christian Lady, who will be missed by many, RIP sweetie. I'm going to miss Ms. Niecy so much. But I know she's celebrating in heaven now. Much love to her and the family. The family is in my thoughts and prayers. I will miss seeing her with Darlene at church every week. She was and is a beautiful Christian soul. Rest in Heaven Ms. Niecy. Say hi to my mom and dad for me!!! May your loved one rest peacefully. Soon, no resident will say, I am sick, according to Isaiah 33:24. (jw.org) My deepest sorrow to you, and your family.